In the FTTH network, cable management is a real task. In order to transmit signals to multiple terminations, large amount of optical pigtails are used in the cabling system. A solution must be found to solve the problem of cable routing. Luckily, the advent of fiber termination box has efficiently handled the crux by accommodating and protecting the fiber cables. Specifically, fiber termination box (FTB), namely optical termination box (OTB), is a kind of fiber optic management product used to distribute and protect the optical fiber links in FTTH Network. Owing to its compact and small size, it is also considered to be the mini version of fiber optic patch panel or optical distribution frame (ODF). The number of ports in fiber termination box is varied from 8 ports to 96 ports, you may choose the right box according to your cable needs. 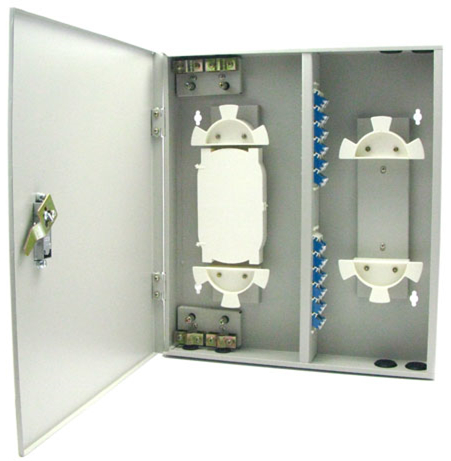 In terms of different designs, fiber termination box can be classified into wall mount and rack mount types. 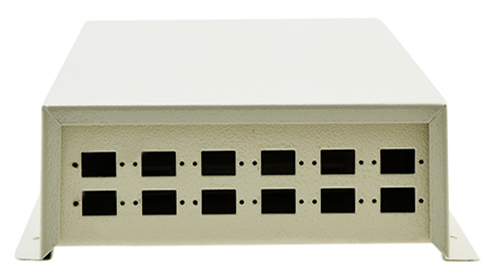 Wall mount fiber termination box is a perfect solution to be used in building entrance terminals, telecommunication closets, main cross-connects, computer rooms and other controlled environments. It is a suitable device for pre-connectorized cables, field installation of connectors and field splicing of pigtails. 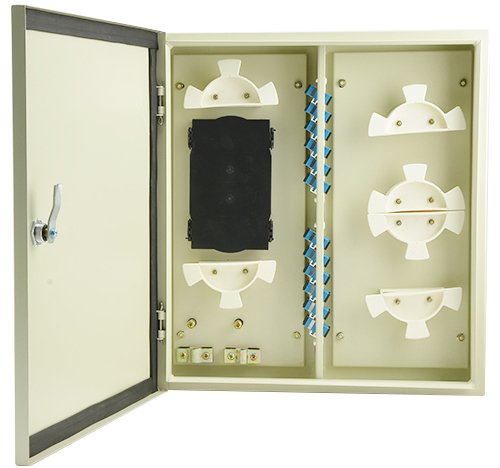 Rack mount fiber termination box is designed for cross-connect and interconnect architecture which has interfaces between outside plant cables and transmission equipment. And the box unit provides space for fiber splicing, distribution, termination, patching, storage and management. With regard to wall mount fiber termination box, it has another two classifications of indoor and outdoor types. Obviously, this is categorized according to the installation site. As the transition point between the riser and the horizontal cable, indoor wall mount fiber termination box offers the operator with optimal flexibility. It serves as the storage place for extended and terminated fibers or as the splice point for spliced fibers. Outdoor wall mount fiber termination box is also used for fiber splicing, termination, and cable management. But its enclosure is usually sealed to prevent cables from environmental damages in FTTH network. Fiber termination box is typically applied to telecom equipment room or network equipment room. It is also available for the distribution and termination connection for various kinds of fiber optic systems, and is especially suitable for mini-network terminal distribution in which the optical cables, patch cores or pigtails are connected. Sometimes, people may mix the fiber termination box with fiber splice tray due to the similar inside structure. Besides other applications, fiber termination box is often used as the terminal junction where a single cable is spliced into multiple optical pigtails that have connectors at one end and no connector at the other end. Sometimes, fiber splice tray is inside the fiber termination box to contain the spliced fibers. But it can also be employed for independent use to protect the spliced fibers. Thus, these two devices are not interchangeable. In conclusion, fiber termination box is an important device used for protecting and distributing optical fiber links. The utilization of fiber termination box greatly eases the stress of cable management in FTTH network. Wall mount both indoor and outdoor FTBs and rack mount FTBs are widely deployed for optical communication infrastructures. Of course, a right selection will also contribute to your network. This entry was posted in Cable Management, WDM & Optical Access and tagged Fiber Termination Box, rack mount FTB, wall mount FTB on July 19, 2016 by Admin.